A lot has happened in the meantime, some of it happy, some of it worrisome. Here’s the conundrum of a family food blog: when illness rides through the centre of Christmas preparations and blogging time both, then what do you do? Write brightly about Peppermint Patties? Or “tell the truth and shame the Devil,” as Mother used to say – no matter how sad the truth might be? 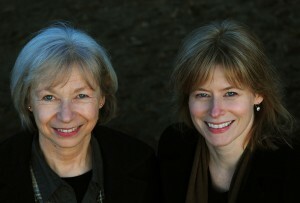 Well, the happy part is that my sister Ann recovered from her bout with pneumonia, although she will never recover from Alzheimer’s. By the time we had our brunch and present exchange on December 27, we were all pretty much returned to normal. I gave the last of my stock of Peppermint Patties to my niece Janet, along with the heirloom 1960s Christmas tree plate. Happily, like Janet, the chocolates are gluten free. I’m even toying with the idea of making them again, just one more time before the holidays are truly over. 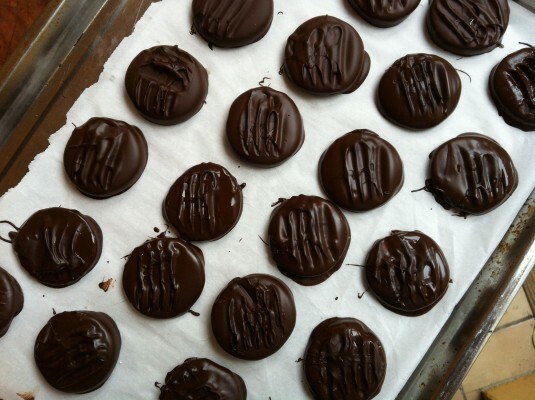 For one thing, despite the oddness of producing something that seems so decidedly commercial, Peppermint Patties are easy to make. And since the chocolate is so much better than any chocolate-mint combination you can buy – barring a trip to a chocolate specialty store – they are immensely pleasing. I’ve made a few changes to the recipe below, which I found in the Gourmet Holiday special edition, from 2011. I’m not even sure what vegetable shortening is, but I know I don’t have any. Since there’s no discernible coconut taste, I think it’s a good change. Gourmet gives instructions for tempering the chocolate: a series of steps for heating, cooling, and reheating it. 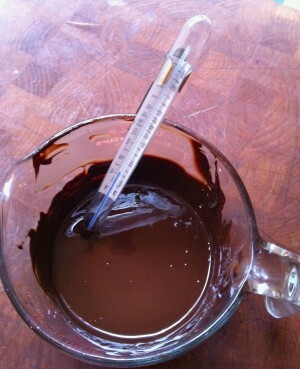 Because I don’t have an instant-read thermometer, I used my old candy thermometer. But it only measures temperatures above 100 degrees, so the critical dipping temperature – 88 F to 91 F – is too low for it to register. Still, it was useful. My habitual way to melt chocolate is in the microwave, at power level four on my machine. Turns out that’s way too hot, almost 110 degrees. So it’s no wonder that on cookie night, Marla and Shirley had trouble with the chocolate spreading. I’d like to apologize now for remarking that they seemed to have “puddling issues,” and even more for thinking that I could have done better. Once the chocolate is cool enough, dipping them is much easier, and the Peppermint Patties, while they don’t look machine-perfect, do look like something you shouldn’t be able to pull off in your own kitchen. Gourmet’s editors suggest that they will keep, refrigerated, for a month. Good luck with that. I’ve noticed that they’re the first sweets to be plucked off a cookie tray. Factor in raids by resident Christmas mice, and you won’t have them for long. Luckily they work just fine if you double the batch, and you can store the un-dipped rounds in the freezer indefinitely. 10-ounces good quality 70 per cent bittersweet chocolate, coarsely chopped. With a hand held electric mixer, beat the icing sugar with the corn syrup, water, peppermint extract, coconut oil and a pinch of salt on medium speed until just combined. Knead on a work surface dusted with icing sugar until smooth. 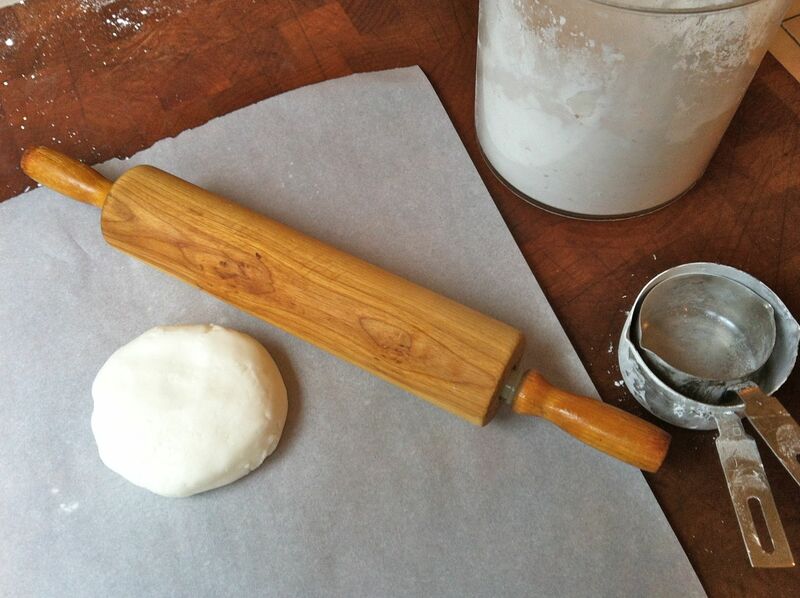 Roll out between sheets of parchment paper on a large baking sheet into 7 to 8-inch rounds, less than 1/4-inch thick. Freeze until firm, about 15 minutes. Remove top sheet of paper and sprinkle round with confectioner's sugar. Replace top sheet, then flip round over and repeat sprinkling on the other side. Cut out as many rounds as possible with a cutter. Transfer to a parchment-lined baking sheet. Gather the scraps and repeat. Freeze until firm, at least 10 minutes. Melt 3/4 of the chocolate in a metal bowl set over a saucepan of barely simmering water. Remove the bowl from the pan and add remaining chocolate, stirring until smooth. Cool until thermometer inserted at least 1/2 inch into the chocolate registers 80 F.
Return water in pan to a boil and remove from heat. Reheat, stirring, until the thermometer registers 88 to 91 F. Remove bowl from pan. Balance 1 peppermint on a fork and submerge in the chocolate, letting excess drip off and scraping the back of the fork against the rim of the bowl if necessary. Return patty to sheet. To make decorative ridges on the patties, immediately set the bottom of the fork briefly on top of the patty, then lift the fork straight up. Coat the remaining rounds, rewarming chocolate to 88 to 91 F as necessary. They will keep, chilled, in an airtight container, layered between sheets of parchment paper for one month. Although these are good, I think they will have to wait til next year. I’m still pleased at the fact that I made the cappuccino shortbread. Definitely a hit with cookie tasters this season.